Mounting accessories and other attachments that help keep your IT equipment and technology safe are extremely important to any business, especially in workplace environments where many hands have to use the same pieces of equipment on a daily basis. NetNest’s range of mounting solutions, locks, and protective hardware cases ensure that your equipment, such as laptops, iPads and other portable devices remain safe from breakage, everyday knocks & scrapes, and theft. 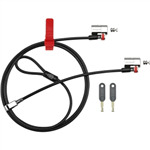 We have cable anchors, laptop locks, wall mounting frames, brackets and more to ensure that your devices are secured and always easily accessible to all those who need to use them on a daily basis. When your business has a large inventory of equipment, you want to ensure that all of your devices are accounted for, and available to use whenever you or one of your staff members need to access them. To ensure that items don’t get misplaced, the most effective solution is to mount them to the wall or desk where the piece of equipment is most likely to be frequently accessed. 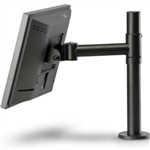 NetNest has a range of wall mounts for monitors and iPads, as well as pole mounts for areas where space is limited. For keeping iPads safe from everyday knocks, bumps and scrapes, try the Kensington Safe Grip iPad Rugged Case, made of sturdy rubber for extra protection.